Chicago Riot Fest is coming up on September 16-18. For those of us who need a little more Riot-related action that weekend, they’ve just announced the aftershows that will go on during the fest. The first of these will go down good and early, as Agent Orange and Counterpunch will weigh in at the Cobra Lounge on Wednesday (9/14). Tickets for that show (and all the Riot Fest aftershows) go on sale Friday (8/19) at 10 AM. Things ramp up on Thursday night (9/15) as well, as The Specials and The Far East will be at Concord Music Hall (tickets). Friday night (9/16) is when things really kick into gear as the festival officially starts up. That night you can catch Dillinger Escape Plan at Cobra Lounge (tickets), Basement, Citizen, and Turnover at the Double Door (tickets), and Taking Back Sunday at the Metro (tickets). 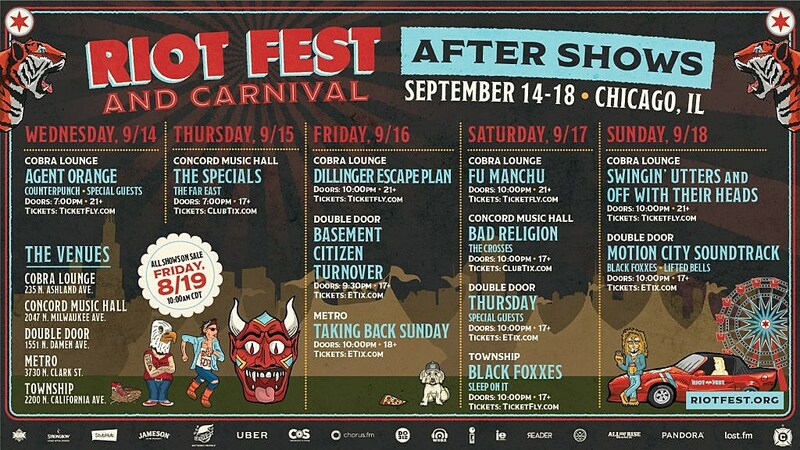 Saturday night (9/17) features Thursday at the Double Door (tickets), Fu Manchu at Cobra Lounge (tickets), Bad Religion and The Crosses at Concord Music Hall (tickets), and Black Foxxes and Sleep on It at Township. And finally, Sunday night (9/18) closes things out with Swingin’ Utters and Off With Their Heads at Cobra Lounge (tickets) and, lastly, Motion City Soundtrack, Black Foxxes and Lifted Bells at Double Door (tickets). Phew, that does it. Meanwhile, you can still snag tickets in various pass configurations for the whole festival proper (not to mention Denver Riot Fest).